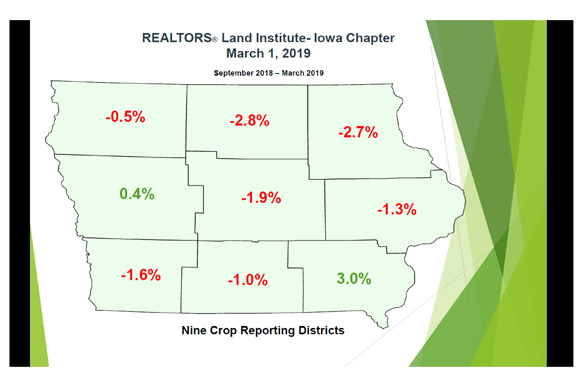 Iowa farmland values have fallen by 1% since September and by 2.7% since March 2018, according to the latest survey conducted by the Iowa Chapter of the Realtors Land Institute. The report released March 13 shows cropland values slipped slightly from Sept. 1 to March 1 as a state average. However, the results varied among the state’s crop reporting districts, with land values dropping 2.8% in north-central Iowa, while rising 3% in southeast Iowa. Statewide, the 2.7% drop in the past 12 months is continuing the trend of recent years. The state average for tillable cropland is $6,794 per acre, according to the March 2019 survey, compared to $6,951 for March 2018. Past surveys showed $4,276 in March 2008 before land climbed to a peak of $8,690 in March 2013 and then began a gradual decline to today’s state average of $6,794 per acre. “Our Iowa Chapter surveys its members every six months and the results are as of March 1 and Sept. 1,” says Hansen, who oversees the survey. The group includes farmland managers, appraisers, brokers and other ag real estate professionals. Their estimates are for bare, unimproved cropland with a sale price on a cash basis. They provide estimates for high-, medium- and low-quality cropland. These cropland classes are then tallied together to come up with the average values for the state and for each crop reporting district. Pasture and timberland estimates are reported separately. This latest survey shows the value of non-tillable pasture and timberland has also dropped in many areas of the state. The recent survey indicated the federal government’s trade bailout program, limited supplies of land for sale and higher yields in some parts of Iowa last fall have helped support land values. Negative factors include international trade uncertainty, decreasing levels of working capital, and slightly higher interest rates. Continued low commodity prices and reduced economic returns from farming make buying ag land less attractive. CHANGE IN LAND VALUES: Here are the changes in Iowa farmland values between September 2018 and March 2019 by crop reporting district. The U.S. has drafted a new trade agreement with Canada and Mexico, which still needs approval by Congress and by the governments of the other two countries. But the progress made so far on the North American agreement does provide confidence that a trade deal can be reached with China, he adds. While the latest survey indicates the average value of cropland rose 3% in southeast Iowa and 0.4% in west-central Iowa over the past six months, the other seven crop reporting districts reported drops in value. The range is from a 0.5% decline in northwest Iowa to a 2.8% drop in north-central and a 2.7% drop in northeast Iowa. Central Iowa is down 1.9%, east central is down 1.3%, and southwest Iowa is down 1.6%. “We still see high-quality land remaining fairly stable,” Hansen says. “It’s the medium- and lower-quality cropland where we are seeing the values really soften.” Of course, it differs from area to area. In northern Iowa, too much rain this past year has dampened buyers’ enthusiasm for land. Kossuth County, for example, had 55 inches of rain in 2018. For more information, visit rliiowachapter.com.